It’s been seven years since I first launched Location Rebel Academy. The whole reason for launching the course was because I’d taken a bit of a unique path in my own life, learned a few things, and thought perhaps it might work for other people as well. I still remember the moment on July 26th, 2011 when I hit send on the email announcing that it was now available. I had no idea what would happen, I just crossed my fingers and hoped people would be interested. We had 24 people join within the first 48 hour minutes before I shut it down. After all, I had to make sure it actually worked before I opened it up to the masses! Well the good news is that the strategies I taught did work. And while the particulars have evolved over the years, what we teach continues to work. In the past seven years, the community has gone from 24 to over 3,000, and the success stories have been remarkable. I have a very vivid memory of this one particular day from when I was in my office job. It was the end of July, on an absolutely gorgeous 80 degree day, without a cloud in the sky. When you live in gloomy Portland, Oregon like I do – these were the days you live for. I was completely out of vacation days, and while my friends were taking the day off to go golfing, I was sitting at my computer with my eyes glazed over trying to focus on another spreadsheet. All I wanted to do was go outside, go hike, enjoy a happy hour beer, or hit the golf course – yet for the duration of that summer there would be very little of any of those. Even on the weekends, I was so burnt out from the stress of work that the thought of actually going to do something fun became much more of a burden than it ever should have been. But what this meant was that even when I did have the energy to go golf or hit happy hour, the terrifyingly low number I saw in my bank account made it that much more difficult to justify. My golf clubs were pushing a decade old, and my friends just laughed at my golf shoes whenever I made it out to the course. Needless to say, this wasn’t a high point in my life. But it’s important to recognize it, because it’s such a stark departure from where I was even 12 months later. Does any of this feel familiar to where you’re at right now? Well, 12 months later I was working for myself and had replaced the income from my day job. I traveled whenever I wanted. I ditched the drab office and was able to work from home, coffee shops, or in some cases, places even cooler than that. And I had way more time and energy to spend time with the people I cared about most. And there’s one word that I believe is completely responsible for that 12 month transformation. You can guess all you want, but you won’t figure it out. Ready for me to tell you what that word is? The most important word for cubicle dwellers is bridge. I know that sounds weird, but hear me out, and you’ll understand where I’m going with this. You see I did something back in those dark days of working a finance, that made all the difference…. I started a bridge business. It’s a business that helps you make the transition from day job and steady paycheck to full-fledged entrepreneur. And that’s exactly what I teach you how to do in Location Rebel Academy. Your bridge business may or may not something you do long term. But the whole goal of starting this type of business is to help you get to the point where you’re making $3k/month as quickly as possible. Because when you’re making that much, all of a sudden you have options. At $3k/month you can pay most if not all of your bills. You can quit your job knowing that you’ve got income coming in, and momentum to leverage. At that point if all you care about is traveling the world with a backpack, you can do that. If you just want some nice supplemental income to your day job, then sweet! You’ve got it. Or you can use that as the stable income that will allow you to then go and start the business you’re really passionate about. The one you’d like to be doing forever. What Are Examples of Bridge Businesses? There are a bunch of different types of bridge businesses out there. 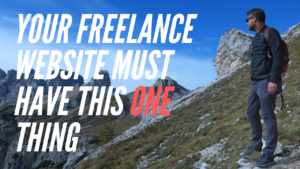 But more often than not, they involve freelancing. For me personally, it was freelance SEO. 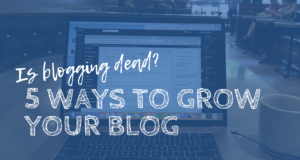 I’d started this blog, and was using it as my training ground of sorts. It was a way I could get hands on and actually test the skills that I was learning about online. 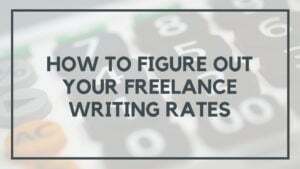 As my SEO skills grew, I freelanced them to help pay the bills, and make the transition from day job to entrepreneur easier. But most people take an even easier approach. 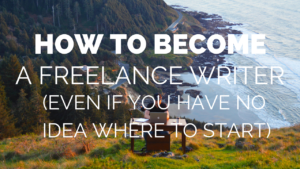 Inside Location Rebel Academy, the majority of people start with freelance writing. Because it’s a skill that’s in high demand, and most of us already have a basic grasp of how to do it. In essence it’s the easiest business to start online. And as you grow your income and confidence by doing it, it opens up all kinds of other doors and options. 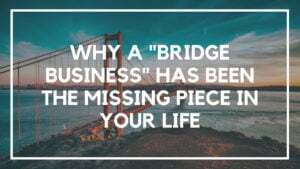 Is a Bridge Business Right for You? Whether Location Rebel Academy feels right for you or not, I do hope that you’ll consider this idea of a bridge business. So often people think that they need to make a big scary leap when they make the transition into entrepreneurship – but it doesn’t have to be that way. You don’t have to leave the security of your day job this week. You can ease into it, and wait until you’re income from your new business or side hustle is in a comfortable spot. So consider whether or not that’s the right move for you. I’ve seen over and over again how taking this first step can make pretty dramatic transformations possible, in a short period of time. Even if you have zero interest in moving to an exotic Asian country, it might be just the thing you need to kick start some shifts in your life. Here’s a question for you, try and answer it honestly. Are you happy with your life and what you’re doing right now? If so, then great! Keep doing what you’re doing. But maybe it just feels ok. It’s not bad, but you’re not excited about where you’re at. Maybe your personal life is great, but you’re not in love with your job. If that’s the case, then I think our Academy and a “bridge business” could be exactly what you’re looking for to begin making those life changes. And don’t worry if you don’t have some brilliant business idea, we help you narrow all of that stuff down. One of the coolest parts about joining this week, is that we don’t just help with the bridge business. Sure, to start off we walk you through everything you need to do to get to that magic $3,000 a month number. All of the tools, strategies, accountability, templates – we got you covered on that. But then we don’t stop there. Whereas most courses will then upsell you for the intermediate stuff, and then again for the advanced stuff, you’re getting all of it immediately. So once that bridge business is bringing in some income, and you’re ready to scale? You’re getting a roadmap for how to do that. Want to pivot once you can pay the bills and build that business around your passion or hobby? You’re getting an entire course devoted to that. Building an email list, creating products and membership sites, doing launches? Check, check, and check. This is a course and community that starts you at square one, and then allows you to grow into it. So if any of this resonates, check out Location Rebel Academy. If you have questions or aren’t sure it’s a good fit? Just email me sean (@) locationrebel.com. One of the best parts about what I do, is that I get to talk to so many people from around the world about their goals and where they’re at. So even if you know you aren’t interested, still take a sec and say hi. I’d love to talk to you. But if it does feel right? Then you can learn more about Location Rebel Academy here.